The three Cahall brothers attended their first National race together on Sunday July 3rd, 2011 at Nelson Ledges in Garrettsville, OH. 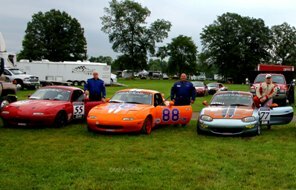 The impressive fact about the three of them attending a National race together is that Bob is in his rookie year in the SCCA and a National race requires a minimum of six completed races. To do this, Bob has competed in the SM, SSM, and STU classes in just four Regional race weekends. This weekend was also special because Ted still needed 11 National points to gain entry to the SCCA National Championships in September. Ted flew into Cleveland airport from Seattle. Larry flew into DC from Chicago and drove the motor home over to Nelson Ledges. Bob joined by driving from Chicago to Cleveland and picked Ted up at the airport. Larry, Ted and Bob practiced on Friday and Ted set a new personal best as compared to the Double National held at Nelsons last year. Larry and Bob both did well for their first time at the track. On Saturday, in the morning session, Ted set a new personal best for Nelson Ledges and qualified with a 1.19.527. This qualified him in 5th position for Sunday's race. Since the morning was cool air and low humidity, Ted figured he would not get a better qualifying time in the afternoon, so he sat out the afternoon qualifying session with his older brother Larry. Only two back of the pack cars did improve their times in the afternoon. So Ted was smart not to tear up his car and needlessly tire himself before the big day on Sunday. Mike Collins finished 2nd behind Charlie Campbell with a 1:18.896 fastest lap. Larry Cahall finished 9th and earned 4 National Points in his very first National race. More photos on Facebook courtesy of Karen Dildei.